After your baby has arrived, and you’ve been “introduced” officially, your baby will have their very first doctors exam. This is when you will get the chance to hear just how much your baby weighs. From this point on, your babies weight will be one of the “indicators” of a healthy baby, and for this reason it can be the cause of some anxiety for parents. When you are looking at your baby’s weight measurements, it’s important to keep a few things in mind, so you know when to be concerned. Babies who are born at full term (37-40 weeks) weigh in the range, between 5.5 pounds and 9.8 pounds- the most common newborn weight is about 7.7 pounds. If your baby is over or under those weights, they may be taken for some extra tests run and extra observation to watch for other medical issues- but it doesn’t always mean something is wrong. Your baby will be weighed a few times in their first 48 hours of life. You will notice a drop in their weight during this time. They can drop as much as 10% of their birth weight, since your baby arrived with extra fluid. As they drop that extra fluid - their weight will drop as well. A new born should be back up to birth weight within the first two weeks of their lives. If there is a concern about your baby’s birth weight and/or rate of loss/gain, you may be asked to come in to the doctor for “weight checks”. You can expect that your little one will gain about 1 to 2 pounds in the first month. If you are breastfeeding: To start, you should be feeding your newborn every few hours. When you feed them, you will want to be sure to keep them on one side for ten minutes, burp your baby, then switch to the other for another ten minutes. Make sure to start on the side you left off on during the previous feeding. In the first few days, it can be a challenge to keep your little one awake for a feeding, and you should remember that your milk will not come in right away. Just keep at it, and work to get a routine established with your little one. As you and your little one get the ‘hang’ of things and your milk comes in, you may be able to go a little longer in between feedings, but make sure they are nursing at least eight to twelve times each day. Your breasts should feel lighter after a feeding, if they feel hard and/or heavy, your baby may not be draining them. Try these tips to help increase your breast milk supply. If you are bottle feeding: Your baby will eat an average of 1.5-3 ounces of formula every 2-3 hours. This should increase as your little one gets older. They also may hit growth spurts, during which they will eat a little more then normal, but may drop back down. Give your baby about half of the bottle, then stop to burp them. 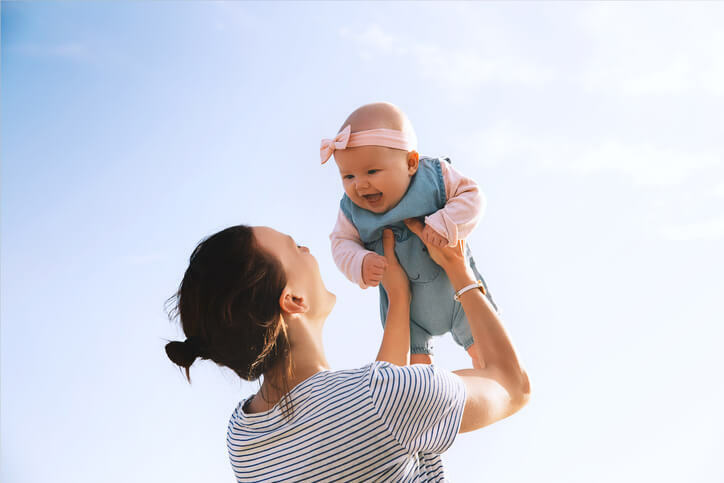 It can be easy to obsess over your baby’s feedings and weight, since it is one of the most important indicators of your little one’s health - but you can ask yourself a few questions to check in and see if you need to be concerned. 1. Is my baby having wet/poppy diapers regularly? By about a week old, your little one should have 6-8 wet diapers and at least a few poopy diapers a day. As your baby gets older, you will see the number of diapers decrease to around 4-5. A newborn should have a yellow/seedy colored poop (after the meconium has passed) - breastfed babies will have a poop that is a more liquid in consistency, while formula fed babies will have a little thicker. If anything seems off with your little one’s diapers, give the doctor a call. 2. Does my baby seem satisfied after a feeding? When you are done feeding your baby- from the breast or a bottle, your baby should seem settled and content. If they seem restless, fussy, or like they are in pain, you should give your doctor a call. 3. Does my baby seem listless and extra sleepy? If you are having a hard time waking your baby for feedings and they start to show signs of being extra sleepy all the time, go ahead and check in with your doctor. 4. How is my babies color? Make sure your little one has a healthy color to their skin, if you see any yellowing of their skin or whites of their eyes, or they appear abnormally pale, give your doctor a call. 5. How is my baby doing on the growth chart? You may be at the doctor and hear that your baby is in the 5th percentile for their weight or height, or maybe you have heard that your little one is in the 90th percentile - but what does that all mean? Should you be concerned? The growth chart gives the doctors an indication on how your child is growing compared to other children their age, but more importantly, it let’s them keep an eye on the “track” your little one is growing on. If your baby measured in the 95th percentile at birth, but at their two month check up, they suddenly drop to the 5th percentile - it can be an indication of a problem. A healthy baby will usually stick to their unique growth curve. There is no need for alarm if your baby is always measuring in at the 5th percentile, as long as they are growing and you don’t see any other warning signs. 6. Should my baby weight as much as my friends baby? Don’t fall into the trap of comparing your little one to other babies his or her age - they are all unique! Your friend’s baby may weigh closer to the average baby than yours does, but as long as you are not seeing any other warning signs, understand that every adult doesn’t fit into the “average” size, and neither will your baby. Always remember, as a new (or even experienced) parent, you are allowed to call the doctor and ask your questions - if you feel something is wrong, check in!